Heat a grill or skillet on medium heat. In a large bowl, mix together ground beef, seasoned salt, pepper and oregano. Divide mixture into 6 sections then roll each into a ball. Press each ball down flat to form a patty. Place a slice of cheese on each cooked burger. 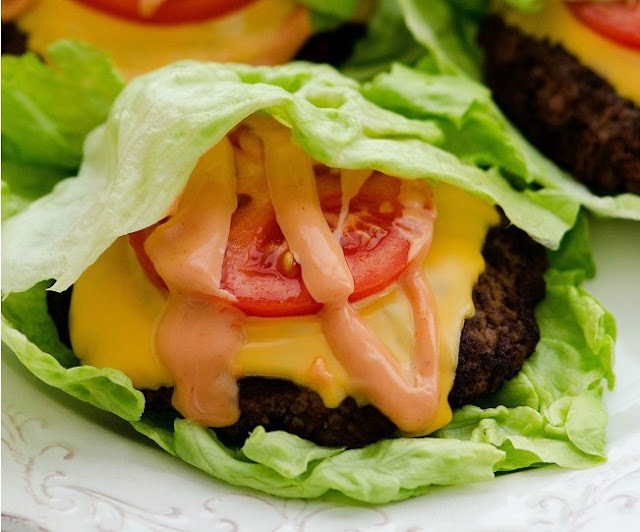 Place each burger on a large piece of lettuce. Top with spread (see recipe below), one slice tomato, red onion and whatever else you like. Wrap the lettuce up over the top and serve. Enjoy! Spread: In a small bowl mix together all the spread ingredients. Refrigerate until ready to use.